Both of the teams facing each other for the NFC Championship on January 17, 1988 had concerns coming into the postseason. While the Washington Redskins won the NFC East with an 11-4 record in the strike-affected season, Head Coach Joe Gibbs’ team had to overcome problems along the way. QB Jay Schroeder was erratic and split time with 32-year-old veteran QB Doug Williams, who took over the job in the playoffs. RB George Rogers was hampered by a toe injury, necessitating the use of unproven rookie RB Timmy Smith, who joined with veteran Kelvin Bryant, an outstanding third-down receiver out of the backfield. The receiving corps was strong, as well as the offensive line. 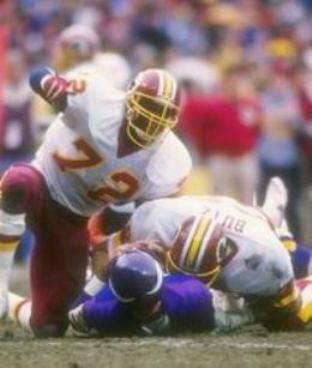 DE Charles Mann emerged as a star across from the talented but erratic Dexter Manley and veteran CB Darrell Green was joined by talented newcomers in the defensive backfield. The Redskins got past the Bears in their Divisional Playoff game. The Minnesota Vikings, coached by Jerry Burns, lost all three of the games that included replacement players and then barely made it into the playoffs with an 8-7 record after losing three of their last four regular season games, including one to the Redskins. However, they thrashed New Orleans in the Wild Card Playoff and then won a stunning upset over the top-ranked 49ers in the Divisional round to advance to the conference title game. 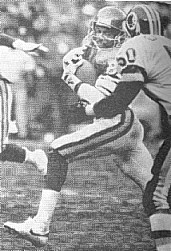 QB Wade Wilson played well in place of injured starting QB Tommy Kramer and WR Anthony Carter averaged 24.3 yards per catch during the season and lit up San Francisco for 227 yards. The defensive line was outstanding and included ends Chris Doleman, a converted linebacker, and Doug Martin and tackles Keith Millard and Henry Thomas. SS Joey Browner was a solid Pro Bowl-level contributor. It was a mostly cloudy day in the thirties with 55,212 in attendance at RFK Stadium. The Vikings drove to the Washington 35 in the first series of the game before having to punt. Bucky Scribner’s kick was downed at the two. George Rogers ran twice for 12 yards to give the Redskins some room. A Doug Williams pass to WR Gary Clark and another carry by Rogers got Washington out to the 30 before WR Ricky Sanders took off for 28 yards on a reverse. Williams tossed two incomplete passes before, on third-and-ten, he hit Kelvin Bryant for a 42-yard touchdown to complete the 98-yard drive. Ali Haji-Sheikh added the extra point to give the home team a 7-0 lead. Minnesota went three-and-out on its next possession and, to make matters worse, Scribner’s punt traveled only 19 yards, thus giving the Redskins good field position at their 45. However, after advancing to the Minnesota 21, Haji-Sheikh missed on a 38-yard field goal attempt that hit the right upright. The score remained unchanged heading into the second quarter. The game settled into a defensive struggle with neither club able to sustain a drive. On a first down play with just over five minutes remaining in the half, the Redskins got something going when Timmy Smith took off on a 34-yard carry to the Minnesota 31. However, they gained just two more yards before Haji-Sheikh attempted another field goal, this time from 47 yards, and failed again. The Vikings struck back quickly as Wade Wilson threw to TE Steve Jordan for 36 yards. Three plays later, Wilson connected with WR Leo Lewis for a 23-yard TD and, with Chuck Nelson adding the point after, the score was tied at 7-7, which was the score at halftime. The teams again traded punts during the third quarter, battling for field position, until a pass by Wilson that was tipped by DT Dave Butz was picked off by LB Mel Kaufman to give the Redskins the ball at the Minnesota 17. Four plays later, Haji-Sheikh kicked a 28-yard field goal to put Washington ahead by 10-7. Early in the fourth quarter, the Vikings put together a 10-play drive that went 52 yards. Wilson hit Anthony Carter (pictured at right) for a 23-yard gain to the Washington 30 and throws to RB Allen Rice for 15 yards and Jordan for 9 got the ball inside the ten. But with first-and-goal at the three, Minnesota was unable to cross the goal line on three running plays and settled for Nelson’s game-tying field goal from 18 yards. The Redskins responded by going 70 yards in eight plays, the first four of which were runs by Smith. Williams then went long for Clark to pick up 43 yards to the Minnesota 11. Another Williams pass to Clark was good for a seven-yard touchdown that put Washington ahead to stay. There were still over five minutes left on the clock as the Vikings regained possession following a 28-yard kickoff return by RB Darrin Nelson. With Wilson completing five passes along the way, Minnesota advanced to the Washington six. However, three throws fell incomplete, including the last one on fourth down that bounced off Nelson’s hands. The Redskins became NFC Champions by a score of 17-10. Washington led in total yards (280 to 259) although the Vikings had more first downs (16 to 11). The Redskins were stronger on the ground (161 yards to 76). They also accumulated eight sacks, with two apiece by Dave Butz and Dexter Manley, while the Vikings had none (pictured at top #72 Manley and Butz at right). Minnesota also suffered the game’s only turnover. Doug Williams completed only 9 of 26 passes for 119 yards, but two were for touchdowns while none were picked off. 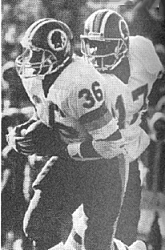 Timmy Smith (pictured at left taking handoff from Williams), who ran the ball a mere 29 times during the regular season, rushed for 72 yards on 13 carries while George Rogers added 46 yards on 12 attempts. Kelvin Bryant, who had just four rushing yards on four carries, led the Redskins with four catches, for 47 yards and a TD, while Gary Clark had 57 yards and the winning score on his three receptions. For the Vikings, Wade Wilson was successful on 19 of 39 throws for 243 yards and a touchdown as well as an interception and was also the club’s leading rusher with 28 yards on four carries. Anthony Carter caught 7 passes for 85 yards. RB Alfred Anderson had the most rushing yards of any of the team’s running backs with 25 yards on four attempts. The Redskins, in the Super Bowl for the third time in six years, exploded in the second quarter on the way to a big win over the Denver Broncos. They sagged to 7-9 in 1988. Minnesota again reached the postseason as a Wild Card team with an 11-5 record but fell to San Francisco in the Divisional playoff round.